Here is a list of some of the most important presentation stats we could find: what is working, what is trending, and what people struggle with when it comes to giving successful talks. Some of these numbers come from brand new research, and others are tried and true classics. But one thing is certain: all are important to keep in mind when preparing presentations in the year to come. 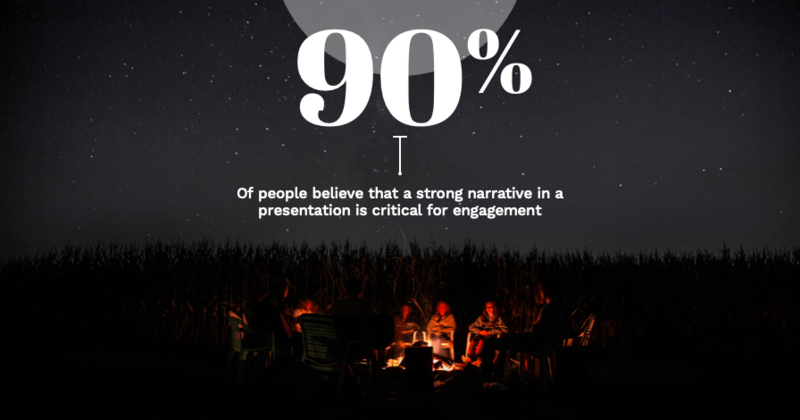 90% of people believe that a strong narrative in a presentation is critical for engagement. Compelling data and facts can help you illustrate your points. But if you want to make people feel engaged when you present, you need to incorporate a story. Stories draw people in to a talk and keep them rapt, so you can ensure no one tunes you out while you deliver your important ideas. 55% of people say a great story is primarily what holds their focus during a presentation. Appeal to what the majority of people need in order to focus on a talk, and incorporate a narrative. A great story is key for keeping people rapt during a presentation and moving them through it start to finish. To craft a story that works for your presentation, rely on a tried-and-true hero story structure. Place your audience as the hero at the center of the story, then show how your ideas can guide them from a less-than-optimal present to an improved future. A hero story works for holding attention because it builds suspense and offers a satisfying resolution. 46% of presenters feel that the hardest part of creating a successful presentation is crafting a compelling story. Storytelling is important in presentations—but it’s also difficult. Many presenters find it hard to come up with a narrative that works both for their data and for their audience. To find the right story for your presentation, try finding common ground with your audience. You can do this by using our Audience Needs Map. Once you really get who your listeners are, you can write a narrative that really appeals to what your listeners want, feel afraid of, dream about, and more. You can also write a compelling story by contrasting “what is” (the present) vs. “what could be” (the future if listeners choose to adopt your ideas). 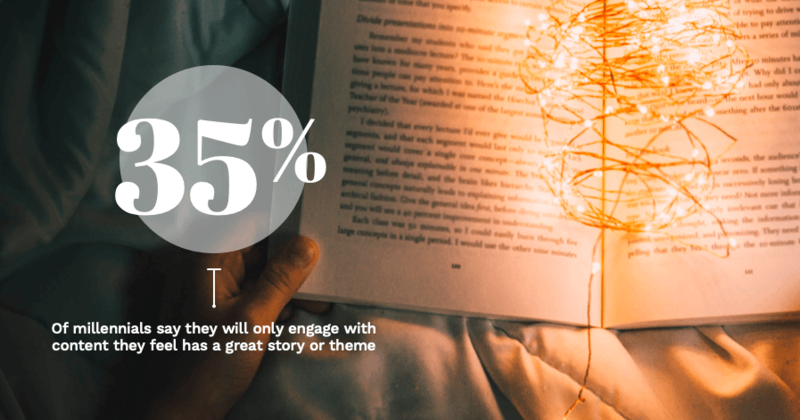 35% of millennials say they will only engage with content they feel has a great story or theme. More and more millennials are taking over the workforce. Make sure you appeal to this ever-expanding powerful demographic by focusing on narrative as you craft your talk. As Gen Xers retire and millennials take over, it’s important to craft your persuasive content to appeal to their values. Experts estimate that 30 million PowerPoint presentations are created every day. There are A LOT of PowerPoint presentations written and delivered in the workplace every single day. And, experts believe that the number will continue to grow. So, if you want to make your presentation stand out from the rest, you have to focus on creating a well-designed, visually-pleasing presentation filled with convincing data and a narrative structure that resonates. Overlooking any one of these critical components can mean that your talk will get lost in the sea of all of the other mediocre presentations being given. 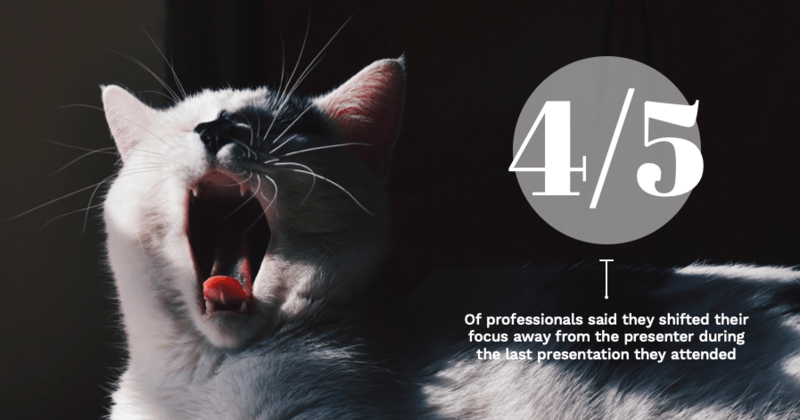 4 out of 5 professionals said they shifted their focus away from the presenter during the last presentation they attended. Keeping people’s attention for the duration of a presentation is tough. Consider using specific presentation techniques to boost engagement. 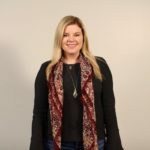 Some of the most reliable include: finding common ground with listeners, interacting directly with your audience, using stunning, eye-catching visual aids, and making sure that you work on your delivery skills. 70% of marketers believe that presenting interactive content is key for engaging your audience. If you want to be better at engaging your audience and making sure they do not disengage as you talk, interact with them directly. During your presentation, encourage direct interaction by doing things like answering audience questions, polling listeners about various topics, asking for feedback, and encouraging social media posts (etc., etc.). 64% of people believe that a flexible presentation with two-way interaction is more engaging than a linear presentation. Rather than simply delivering a linear presentation, interact with your audience. They will feel more involved in what’s happening and be less likely to tune you out. 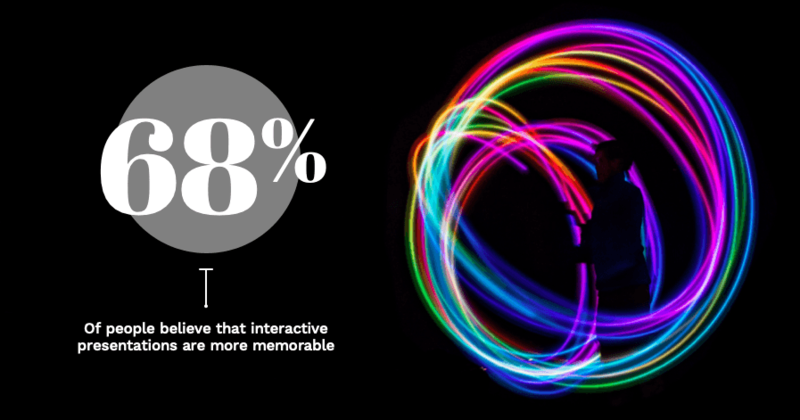 68% of people believe that interactive presentations are more memorable. If you want your listeners to leave remembering the Big Idea or main message of our presentation, make sure you engage directly with them. Personal interaction with the presenter makes people more likely to remember the ideas you are trying to impart. 65% of people are more easily persuaded by presentations that incorporate two-way interaction. Not only will people remember your ideas if you interact with them, but they’ll also be more likely to adopt them. Audience interaction can be key for talks that effectively work to persuade. 2 million events and meetings are expected to utilize live polling and Q&A apps by 2020. More and more events, conferences, and meetings now incorporate technology that facilitate active participation for attendees. During your talk, consider using apps for live polling or question-and-answer sessions so that your audience members feel more engaged in the experience. Presentations with visual aids are 43% more persuasive than the same presentations without visuals. When you give a presentation, it is important to accompany that presentation with a visual aid to illustrate the important points in your talk. Using a visual aid helps appeal to visual learners and improves people’s ability to recall the information you share. Visual aids can be projected, like Powerpoint Presentations, or they can be printed and distributed beforehand, like Slidedocs. 84.3% of presenters said they crafted presentation slides that were highly-visually focused. If you design a presentation that incorporates a slideshow, make sure that slideshow is more focused on visuals than text. 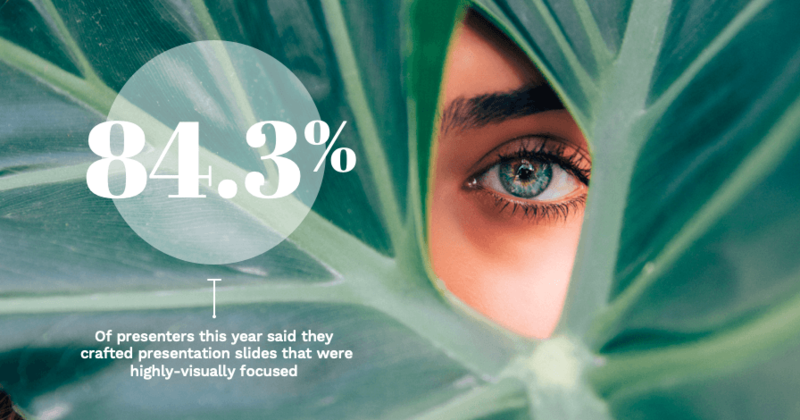 More presenters than ever are using visually-pleasing images to complement the content they deliver and eschewing slides that are over-filled with data or written words. 54.9% of people say that less than 25% of their presentations contain text. Having too much text on your presentation slides makes it hard for your audience members to digest what they see, and it distracts them from what you are saying. Stick to images and illustrations in your slideshow to help highlight and elucidate your message without muddling it. Audience members should be able to take in your slide and its meaning within 3 seconds. Every slide in your presentation should pass the Glance Test—that is, audience members should be able to look at a slide and understand what it means within 3 seconds. 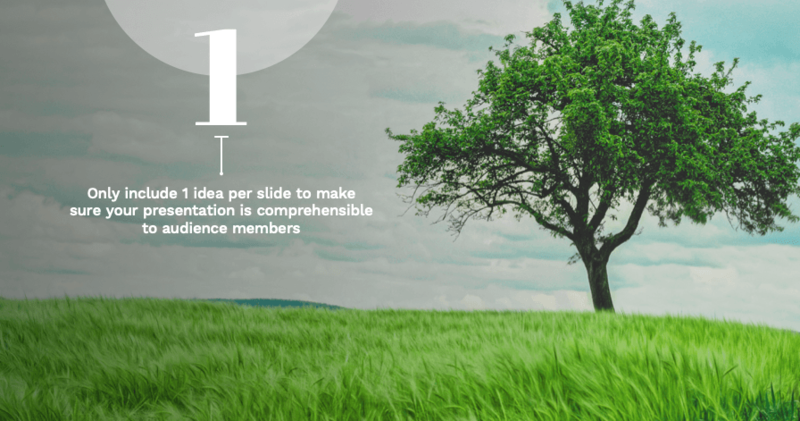 Only include 1 idea per slide to make sure your presentation is comprehensible to audience members. Because all slides must pass the glance test, it is an essential rule of all presentations to only include 1 idea per slide. By only including 1 idea per each individual slide, you keep all of your information organized for listeners and deliver it to them in digestible-sized chunks they can take in with a glance. Even more specifically, include only 1 statistic per slide in order to make an impact with your data. You should only include 1 idea per slide in your presentation. But, you should also be sure to only include one number or statistic per slide. When you only use one number per slide, that number stands out, and you can use it make a powerful impact. Shorter presentations are more effective than longer ones; poor performing investment presentations were 12 pages longer than ones that performed well. A recent study showed that presentations asking for investments were more successful if they were short. The longer the presentation, the less likely it was to receive funds. Keep this in mind as you design your presentation. Brief, succinct talks and slideshows help ensure that listeners stay engaged, understand your information, and do not succumb to boredom as they sit through your talk.